Free Self Help Shortcuts To Being Happy And Feeling Good Always! To really understand the nature of existence is to understand the nature of you, the nature of who you really are. By inquiring with an open mind into the ideas of awareness, beliefs and consciousness, you’ll first recognize and then choose to experience positive abundance, creativity, being happy and feeling good in your daily life. Expand your conscious awareness by revealing hidden beliefs! By having both the willingness and the eagerness to inquire within, over time, you’ll also come to realize, first-hand, the truth of what’s being imparted on this website. Once discovered, you too will reap the benefits and rewards of this easily accessible self help knowledge. And thus, you’ll start living a fear-free, loving, abundant and happy life. One of the tools I use to inquire into and discover the nature of existence is called (to use a label) metaphysics. Metaphysics is the idea of understanding the physics of reality, without needing to understand the math behind it. As beings born into a world of intellect, rationality, reason and logic, we’ve become far too complicated and detail oriented in our efforts to understand "how" and "why" things are as they are. This inspired shortcuts website aims to simplify that understanding. If you’re not aware of something, then you can’t do anything about it. Once you’ve become aware of "why" or "how" something is affecting you, then you have the choice and ability to change it to better serve you. if you so desire. Those who were already in this reality when you arrived, for the most part, were not aware of and thus did not understand the nature of existence, and so they were unable to pass on knowledge that they didn’t know about to you. Perhaps the greatest challenge which lies before us is to unlearn what we learned from those people who don't know who they really are! Most people are born into a particular family in a certain country and they unconsciously adopt the customs and belief systems of their birthplace. The majority never question those beliefs, so they never break that mold. When you stop to really think about it, the one truth that's undeniable and indisputable, and which doesn't require any form of belief, is the fact that you do exist right Here and right Now. Everything else is open to belief! Whenever you inquire about the time of day, the one answer that will always be correct is: the time is Now. The time is never then or will be… No matter what time you think it is, the real time is always Now. While it's true from our limited perspective of reality that moving through space from point A to point B takes "time," the idea of linear time is really an illusion. Once we raise our vibration to a higher frequency, we can choose which period of time to experience, without the illusion of moving through space. 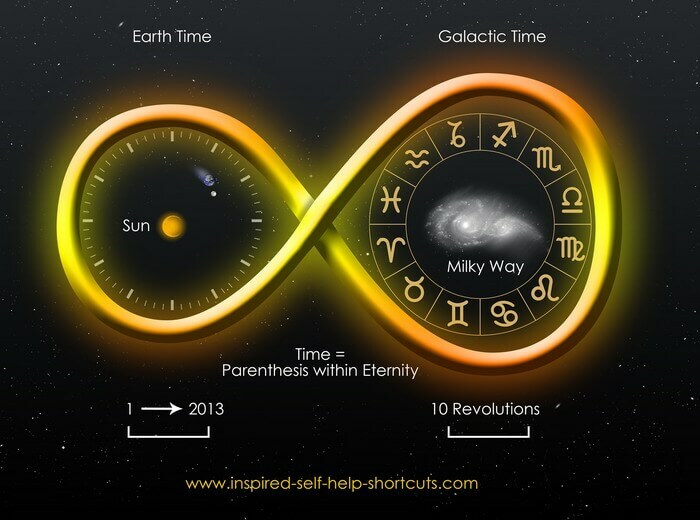 Time is always contained within the infinite wave of eternity! Earth time is measured by revolutions of the earth around the Sun. Galactic time is measured by revolutions of the Milky Way, called the procession of the equinox, a cycle of 26,000 years; which is also the basis of the Mayan long count calendar. However, no matter how much time we record, time always remains a mere parenthesis within eternity! Then you’ll come to logically realize that you are, we all are, spiritual beings who exist (and have always existed) Here and Now forever. And while that idea may be frightening for some, that truth is eternal in nature. At the core of the nature of existence lies spiritual truth. However, there are so many definitions of that word that it pays to be careful not to buy into any definition, unless you’ve examined and confirmed it for yourself. Understanding this enables us to move beyond victim-hood and into a life experience that’s consciously chosen by us. From our non-physical spiritual perspective, we know that we’ve projected a piece of our consciousness into this physical reality of self-imposed limitations. Life on earth is a game of remembering this truth. The most important thing that you were not informed of, by parents and others (who didn’t know), is the existence of your spiritual or non-physical counterpart. I refer to this part of our being as our higher self. Once we consciously re-member or re-connect with this part of our being, our life begins to unfold in a harmonious and balanced way. The guidance coming from our own higher self is tantamount to the epitome of self help. When we feel good it’s because our current thoughts are in alignment with those of our higher self. When we vibrate in the vicinity of the vibration of our higher self, we always feel good and then all things wanted are near and manifestation is imminent. If you’re unhappy and you don’t feel good, first recognize and examine your beliefs, and then redefine your beliefs and the consequent resulting thoughts until you begin to feel better. Keep doing this until you do feel good. The now wave of positive and negative energy. The Now Wave contains both positive and negative energy. By staying positive as you travel through it, you’ll receive all wanted things and minimize the possibility of receiving any unwanted things. Notice how you’re feeling most often to know whether you’re heading for a positive or negative manifestation. Look around you. Do you see anything made by man that wasn’t first an idea that came from someone’s imagination? No, because absolutely everything came from imagination before being manifested or realized as reality. Even when you're sitting on a beach while on holiday, realize that you wouldn't be there absent prior imagination of being there. In addition, what you probably don’t realize is that any idea that enters your imagination came from your own higher self. To fully grasp this, one must remember that all ideas already exist as potential within creation. Your body is your spirit represented in physical form. So it makes sense that healing your body is most effective when done on the level of energy. As physical beings we balance energy through our thoughts, beliefs and emotions. By redefining our beliefs into those which better serve us, we cause our vibration to increase and we feel better. This in turn results in a more balanced and harmonious, dis-ease free, physical body expression. Today’s world strongly believes in the supremacy of intellect, reason and logic. But really, as certain individuals and cultures on earth know, our heart is our primary tool for navigating this reality, rationality is secondary. Be Happy Now and Feel Good Always then all good things will come your way! By not focusing on things that could go wrong and thus, spending your time in worry or doubt you’ll maintain a happy state of well-being. And from this natural state, you’ll allow all that you consider good to manifest as your experience. Lighten up friend. Why not be childlike while having fun and feeling good on your adventure and game of remembering and exploring reality? Why do you believe that life should be anything other than fun anyway? Forget about mediocrity and move beyond past memories that don’t serve you. Get over your own mind my friend! Only do the things that feel good, excite you and are worthy of your time and participation, do nothing else! Up until this particular transformational life experience, for our soul’s own reasons we wanted to keep the veil between the higher perspective non-physical reality and the limited perspective physical reality in place. Whatever your current life story is, you and you alone have the power within you to change it. Whether you perceive your current life story as good or bad, you are the only one who can change it! It’s only a story. Of course, the ME I’m referring to is the ego-self personality construct. Until you befriend your ego-self and integrate it into your total being, it’ll probably remain negative and it will "try" to control your life, if you let it. I realize that it might be a lot to take in for many people. 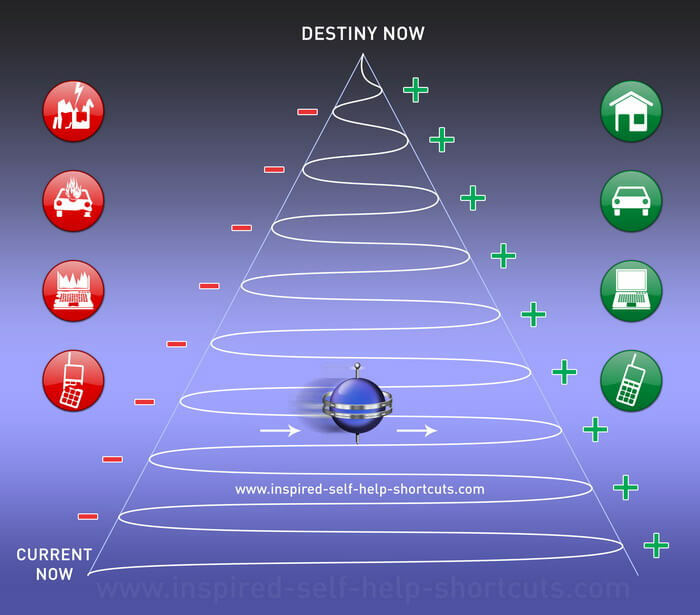 However, if what I’m saying on this inspired self help shortcuts website resonates with you, look at it from this perspective: that’s reality, that’s how it is and how it’s always been - only now you’re remembering this truth. Remembering who and what you are and what life really is, is the catalyst that will move you to lasting positive change! Are you ready and willing to change? 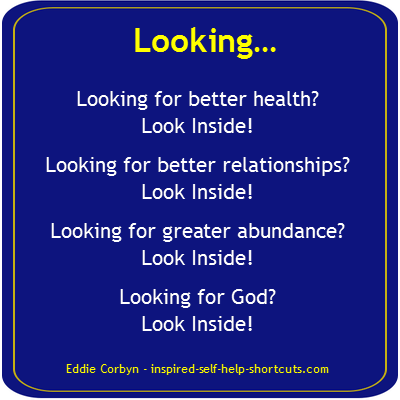 If so, you'll find these inspired self help shortcuts invaluable!